The smartphone market is getting more and more competitive as new devices find their way into circulation but far and away the biggest star and most iconic device remains the iPhone. Today, confirming early expectations, Apple kicked off its WWDC event with the debut of the groundbreaking phone’s fourth generation. Lighter and more industrial than prior versions, the phone gleams from a thinner steel and glass case. Smaller in footprint but bigger in battery life and brighter in display, the phone can deliver 40 hours of music, 10 hours of wireless net connectivity and over 300 hours of standby time. The improvements in battery life and speed owe to the A4 processor similarly used in the iPad. The chip, a custom bit of silicon resulting from Apple’s 2008 purchase of Palo Alto Semi ratchets up performance speed while frugally controlling power consumption. The new display on the phone, at 960×640 pixels hosts as many as four times the number of pixels than the prior 3Gs model. The added image density makes for an incredibly precise, crisp display of text and graphics. On stage to deliver the keynote and introduce the phone, Steve Jobs showcased many of the phones feature to the glee of an excited crowd. A few snafus (like a wireless network overloaded by bloggers reporting in real time on every word of the announcement) aside, there were a few ooh’s and ahs. And even with many of the phone’s features expected thanks to an accidentally leaked prototype, there were still some surprises. iphone 4 features two cameras, one front facing to power video conferencing / chat and another for a users digital photography whims. The outward aimed camera shoots 5 megapixel images, zooms to 5x and can grab HD video too. For gamers, or creative App designers, the phone’s motion control technologies have advanced with the addition of a built in three axis gyro. Matched with the accelerometer previously on board and the phone can now sense six axis movement. As part of the keynote, Jobs looked backward the significant sales miles stones leading up to the new device. So far, he told the crowd, more than 5 billion applications have been downloaded by nearly 100m iPhone/iPod Touch customers. iPads too are selling briskly with one getting swallowed up approximately every three seconds. More than 2m are in the wild so far. The new iPhone, powered with a renamed OS, will be available in the U.S., France, Germany, Japan and the U.K on June 24th. Pre-orders will be taken starting June 15th at Apple’s online store. The planned pricing will be $199 for a 16GB model and #299 for a $32GB unit. Pricing for the prior generation 3Gs will drop to $99. 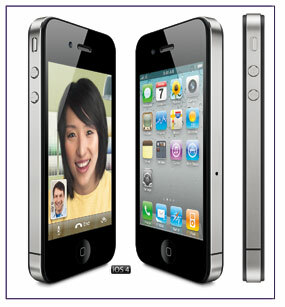 Apple expects an additional 88 countries will get the iPhone 4 in September. iAds, Apple’s in house mobile ad network will debut July 1. More than $60m in commitments have been booked for 2010 making the platform a major force in mobile advertising even before its official launch. a href="http://metue.com/05-28-2010/applevine-apple-tv-getting-a-refresh/" title="Applevine: Apple TV Getting a Refresh? ">Applevine: Apple TV Getting a Refresh?